Snails (Phylum Mollusca, Class Gastropoda) are among the smallest animals at River Legacy. They are often not noticed and, therefore, unappreciated. However, they play a very important role in the environment as decomposers. They feed on dead plants, mushrooms, trees and animals. Some even feed on empty shells from other snails, tree sap and animal feces. While that may sound gross, it is very important that those things are consumed so that those wastes do not accumulate and start damaging the ecosystem. 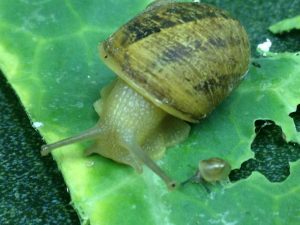 Snails also help out with the calcium cycle, since they retain calcium in their shells. Once they are eaten by many animals (opossums, beetles, millipedes, etc…), that calcium passes to those predators and so on, onto the next ladders of the food chain. There are roughly 60,000 species of snails in the world. This number includes slugs as well as marine snails. They are very slimy, which allows them to stay moist. The need to retain moisture makes them a big fan of water and rain, especially. So far this Spring, we have had alternating periods of rain and dry, hot weather. Next time it rains and the forest becomes very moist, look for snails walking around on different surfaces. A popular place to look for snails at the Science Center is the pedestrian bridge at our western entrance, coming from Rose-Brown-May Parkway. Another place where snails are frequently seen after a rain is the wall on the ramp to our western entrance, just adjacent to Mike’s Garden. If not, any boulder or log in the forest will probably have some. In addition, we encourage you to sign up your children for classes this upcoming summer (classes like Slime Sleuths, Animal Sense-Abilities, PSI: Pond Scene Investigations, among others). 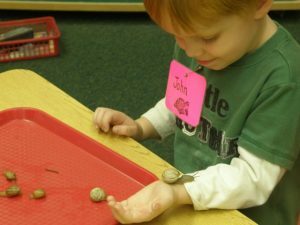 Snails will be an important topic in those classes and students may even get the opportunity to touch and hold snails. For more information on how to sign up, you can visit our website at www.riverlegacy.org/summer-classes.